It's a waste of energy on a massive scale—and a serious climate problem. 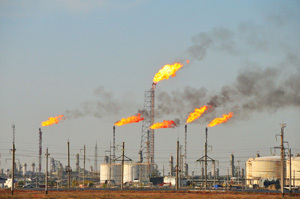 Without proper infrastructure and safeguards, too often the oil and gas industry "flares" natural gas, simply burning it off, releasing dangerous pollution in the process—and as it burns, your money burns along with it. Wasteful flaring as well as venting and leaks from oil and gas wells on federal and tribal lands wastes $330 million worth of natural gas nationally per year, and $76 million from North Dakota alone. The Department of Interior's Bureau of Land Management has finalized a rule that limits this dangerous and wasteful practice—but the new Congress is saying they will try to roll back these needed rules. Please reach out to Senator Heitkamp today, and ask that she stand up for these crucial fiscal, climate and public health protections. I'm writing today in strong support of the Department of Interior's Bureau of Land Management's limits on methane venting, flaring, and leaking. Methane flaring is a significant problem in North Dakota, particularly on our tribal lands where state standards do not apply. The state's limits do not protect the entire population, leaving residents of the Fort Berthold Indian Reservation vulnerable to waste of their natural gas resources and to the health effects of this dangerous pollution. Cost-effective solutions to this problem are readily available. An entire industry devoted to reducing methane pollution, mostly made up of small businesses, is ready to tackle the problem, creating jobs right here in North Dakota while cutting costs. We need you to stand against efforts to block this rule in Congress. Efforts to undermine these crucial protections will hurt taxpayers, our air, and North Dakota's publicly owned resources.